MANILA -- Secretary of State Rex Tillerson laid out the most specific preconditions yet for U.S.-North Korea talks, soon after the United Nations Security Council adopted the largest economic sanctions package ever against the regime. 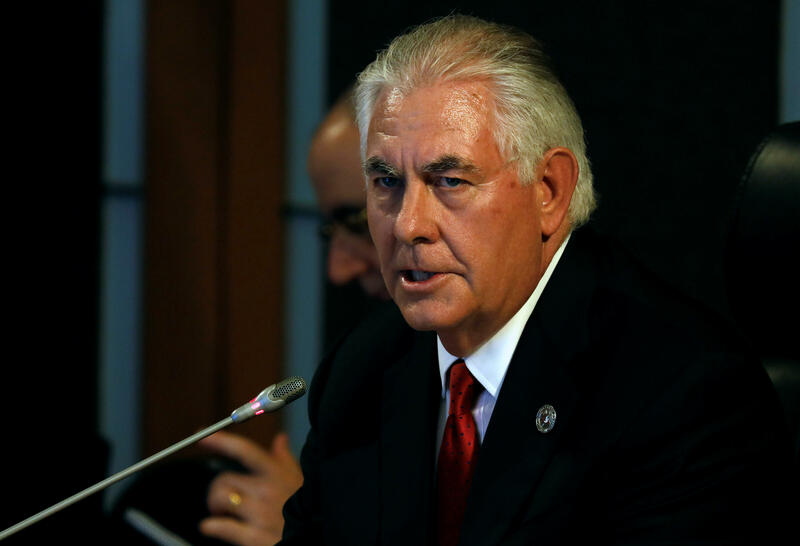 The regime must stop missile launches, Tillerson told reporters in Manila. Though the administration has still not ruled out a preemptive military strike against the North, talks are the preferred option to convince North Korea to completely halt its nuclear program. Tillerson did not specify how long the missile launches would have to be suspended as a precondition to launch talks. "We will know it when we see it," he said. "If they can demonstrate they are ready to sit with the spirit of finding a way forward in these talks by no longer conducting these missile tests -- so this is not a 'give me 30 days and we are ready to talk' -- it's not quite that simple." These preconditions provided some context for Tillerson's comments on U.S.-North Korea talks earlier this year. "North Korea must take concrete steps to reduce the threat that its illegal weapons programs pose to the United States and our allies before we can consider talks," Tillerson said at the U.N. in late April. The secretary of State has repeatedly said that sitting down with North Korea would benefit the regime. He said dialogue will lead the regime to "feel secure and prosper economically." Two days earlier, the U.N. had voted on its strongest sanctions ever against the North after it launched two intercontinental ballistic missiles in July. The sanctions prevent North Korean exports of iron, lead and seafood. The U.N. says the measures will cost the North over $1 billion a year in hard currency. And they will also ban countries from green-lighting the admission of more North Korean laborers, who are said to economically fuel the country's illicit programs. North Korean workers, who allegedly send their earnings to the regime, have been mentioned by Tillerson in the past. And he talked about them again during a lunch meeting with Japan and South Korea. He reiterated the intention of the U.S. to urge countries in Africa, Asia and the Middle East to stop utilizing North Korean contract labor. "What we tell people is to stop supporting the regime and let people return home," Tillerson said. "This is a human rights concern because of the unfair treatment, trafficking conditions and misuse of wages." Tillerson has also been mulling what actions the U.S. should take in response to Russia's expulsion of a large number of American diplomats in Russia. The U.S. will have a response by Sept. 1, he told Russian Foreign Minister Sergey Lavrov in their meeting on the sidelines of the ASEAN ministerial meeting. Tillerson asked Lavrov "several clarifying questions" about the decision, which was announced soon after the passage of sanctions legislation targeting Russia, which neither Tillerson nor President Trump support.